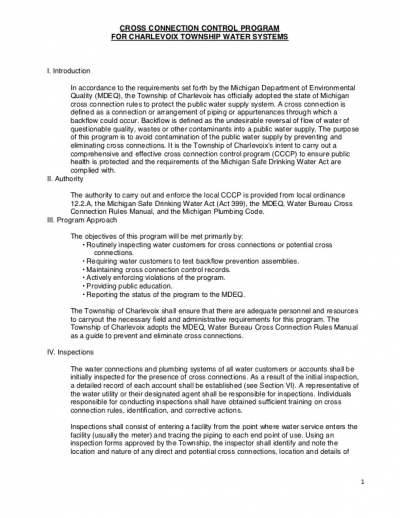 In accordance to the requirements set forth by the Michigan Department of Environmental Quality (MDEQ), the Township of Charlevoix has officially adopted the state of Michigan cross connection rules to protect the public water supply system. A cross connection is defined as a connection or arrangement of piping or appurtenances through which a backflow could occur. Backflow is defined as the undesirable reversal of flow of water of questionable quality, wastes or other contaminants into a public water supply. 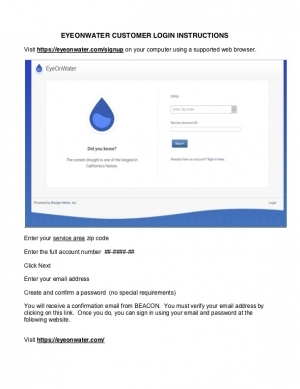 The purpose of this program is to avoid contamination of the public water supply by preventing and eliminating cross connections. 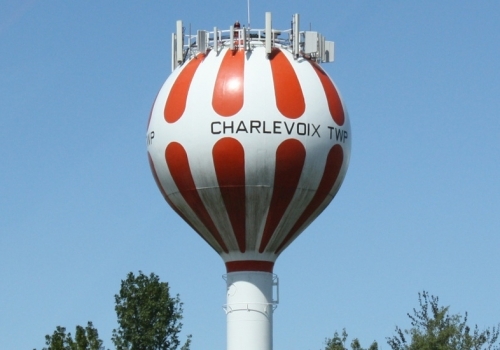 It is the Township of Charlevoix’s intent to carry out a comprehensive and effective cross connection control program (CCCP) to ensure public health is protected and the requirements of the Michigan Safe Drinking Water Act are complied with. Non-township residents will be charged one and one half times township rates. Two new wells and a pump house on the north side have been completed at a cost in excess of $500,000 and depleted the water department funds. The township also needs to begin replacing its water meters. Current meters in some cases are 40 years old and repair parts are not available. New meters are more accurate and transmit a radio signal and can be read with a receiver. The cost of a new meter is $300 each and the meters will be phased in over time. Infrastructure repair concerns – In some areas of the township, the water lines are 40 years old with lines that are tested to last 50 years. That does not mean all lines 50 years old will have to be replaced, however, funds are needed for anticipated repairs and replacement. Better water quality and water supply for many years. Updated electrical and control panels which reduce operational cost. The above fees are for a single residential equivalent unit (REU) application only. 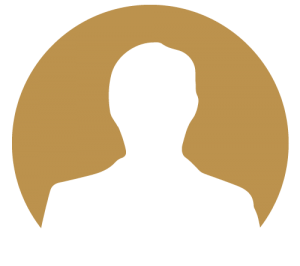 Commercial (multiple REU) applications, or larger and/or multi-family residential applications will require separate computation. 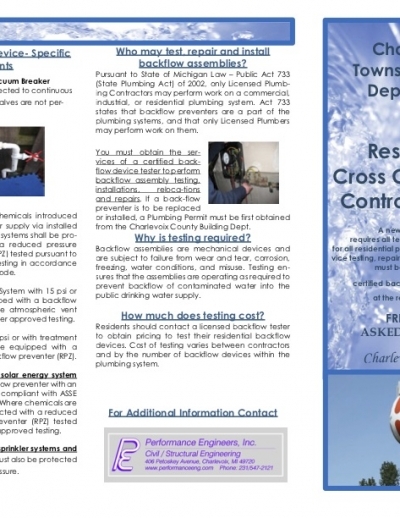 Include tapping of water main by Township, materials and components for connection point at the main. 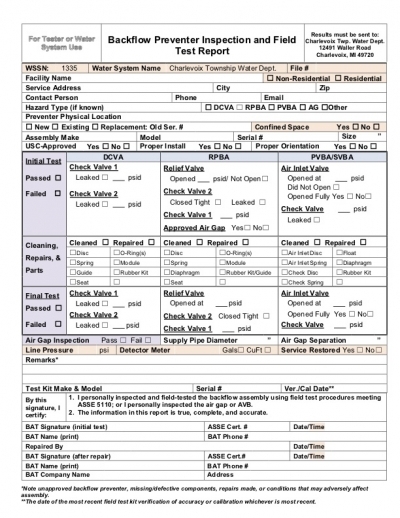 Applicant is responsible for all material / components from main connection point to building, all excavation / trenching, and restoration, including street & sidewalk. *Township will provide 1″ service from point at main to a curb stop set at the applicant’s right-of-way line for single-family residential service requests only. An irrigation meter is considered a private meter and all cost associated with its installation, maintenance and replacement are the responsibility of the applicant. The cost of a standard residential irrigation meter is $350. 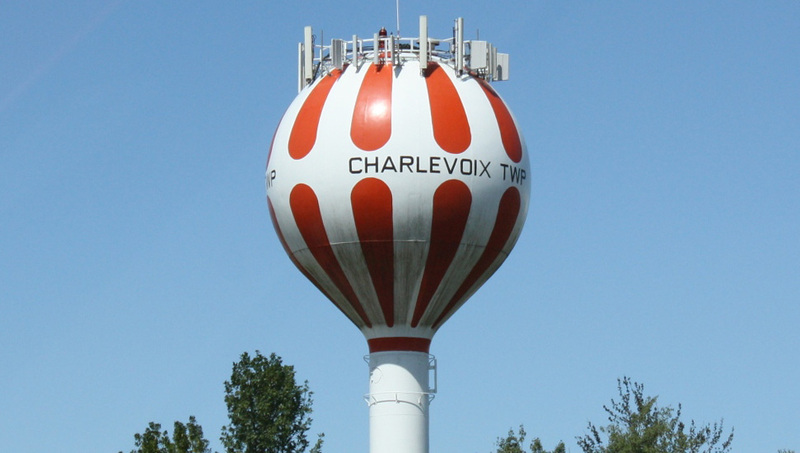 Irrigation meters can only be purchased through Charlevoix Township and must be compatibly with the meter reading system currently used. Any request for emergency on / off service during working hours will have no charge. Any request for new service from November 1st through April 1st may incur an added surcharge for winter excavation conditions. Meter size is not the same as service size. Meters are generally one size smaller than the service pipe without adversely affecting flow. A water meter that is sized down will still have a flow rate that is beyond that of the recommended pipe velocity for the service pipe. The standard meter for 1″ service is a 3/4″ meter (flow rate of 25 to 32 GPM). Max velocity of 1″ copper service is 10 feet/second or 25 GPM.